Reimagining a Disney classic on Broadway is a tall order — the worlds established in the time-tested THE LION KING and ALADDIN on Broadway hold such a special place in our hearts. But if there’s any experience that can rival the feeling you get rewatching your favorite Disney movies, it’s seeing these beloved stories brought to life on a Broadway stage. 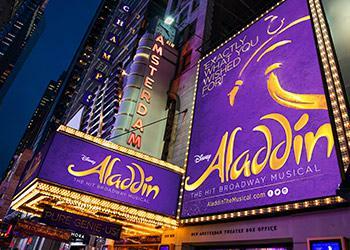 Here are five things that make Disney on Broadway such an unforgettable affair. From “Hakuna Matata” to “A Whole New World” there’s something incredible about watching your favorite Disney musical numbers from the movies performed in person, with colorful costumes, exciting choreography and dazzling scenery. Don’t bother fighting the urge to tap your feet and hum along! You know all the original Disney songs by heart—obviously. And now there’s even more music to love, with brand new songs like “Endless Night” and “A Million Miles Away” written especially for both of Disney’s Broadway shows. Items in the VIP package include a non-alcoholic beverage in a keepsake cup, a souvenir lanyard with a pin and a commemorative photograph. Hoping to secure a particular view at the show? Scout out the best seats by taking a virtual tour of each theatre! 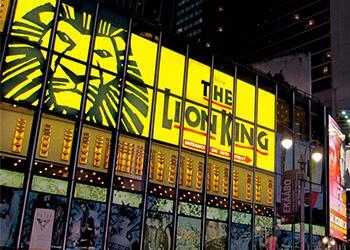 Check out everything the New Amsterdam Theatre and the Minskoff Theatre have to offer! One of the most memorable parts of seeing THE LION KING on Broadway is witnessing the assortment of more than 230 innovative puppets and masks custom-made for the show. These incredible works of art took more than 37,000 hours to create. That’s more than four full years of work! With lots of genuine Disney merchandise available for both shows, you can commemorate your theatre-going experience with a special keepsake like a Young Simba doll or a Magic Lamp ornament (wish-granting genie sold separately). Also, both shows play just a few blocks from the spectacular two-story Disney Store in Times Square where you can stock up on even more mementos. Remember your Broadway experience by taking home a commemorative plush, poster or mug available in the gift store.